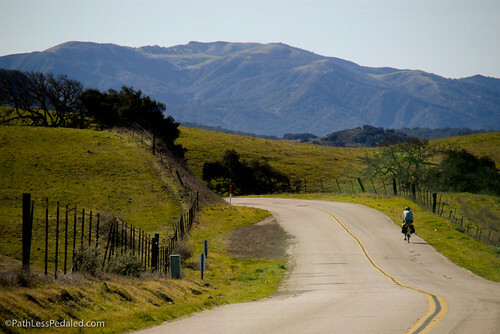 As we rounded the top of the climb on See Canyon Road and inhaled the spectacular views of the hills and valleys surrounding San Luis Obispo, it became clear that we had no idea how good we had it when we lived down here. 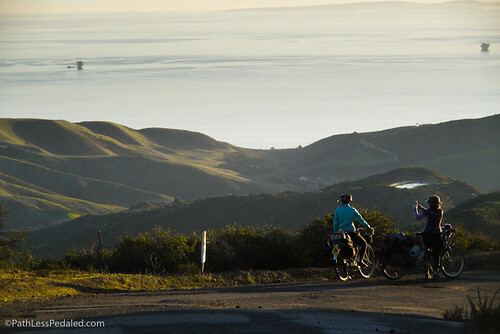 Six years ago, we cut our teeth on cycle touring in the San Luis Obispo area. A short bus/train ride out of Long Beach and we were on open country roads, chatting with the cows, picnicking under the oak trees. We knew it was lovely, but we didn’t have anything to compare it to. 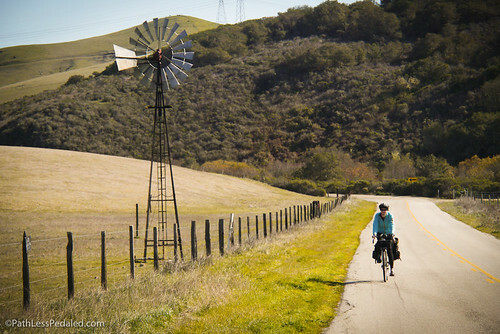 Now, after all of our travels, we have been honestly surprised by the incredible cycling that’s tucked away in the Central California hills. The riding here isn’t just good, it’s a cyclist playground – and you should get here before the tourism folks realize that they’re sitting on a gold mine. 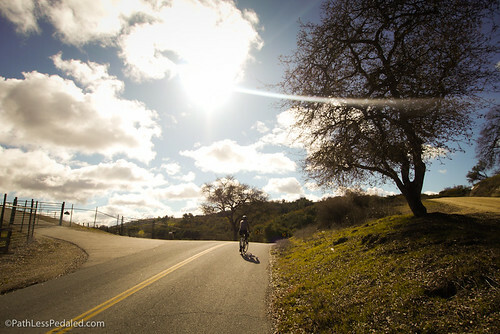 When you land in Paso Robles with a bicycle, your choices are wide and varied. 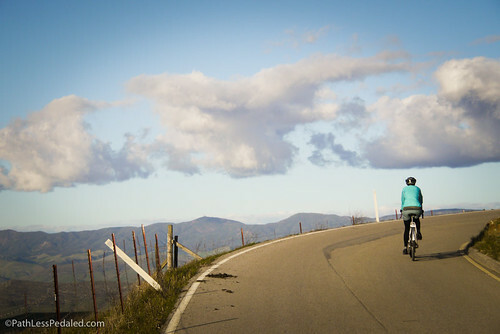 Do you ramble along the rolling hills to the east, winding past the wineries on Linne Road, or do you tackle the steeper climbs to the west, conquering the steep grades on Peachy Canyon Road. For us, the answer was yes and yes. 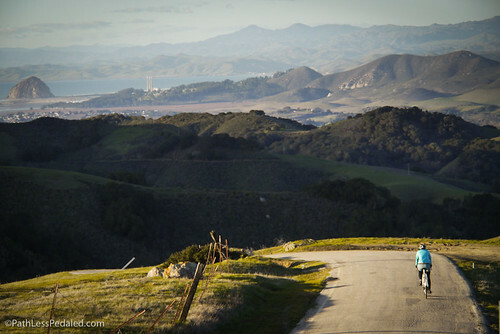 And we were rewarded with swooping curves, oak- and vineyard-lined hillsides, wine tasting, and very few cars. 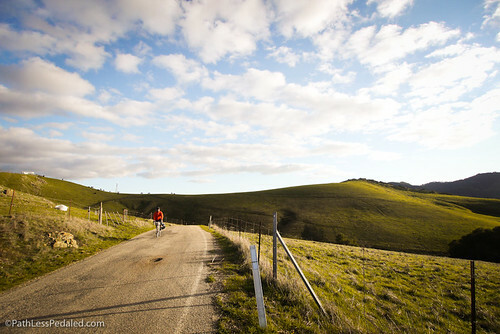 Down in San Luis Obispo, we were tipped off to two very different routes to nearby Avila Beach, which we pieced together into a loop. We followed the mild-mannered Bob Jones off-road path to the beach, stopping along the waterfront for lunch and wine tasting at Peloton Cellars. We returned via See Canyon/Prefumo Canyon Roads, which included a 1-mile-long stretch of gravel, roaming cows, that pleasant sound of nothing-but-your-wheels-whirring-beneath-you, and a surprisingly steep climb that resulted in quite possibly the most rewarding summit ever. What we discovered is an area ripe for bicycle tourism. 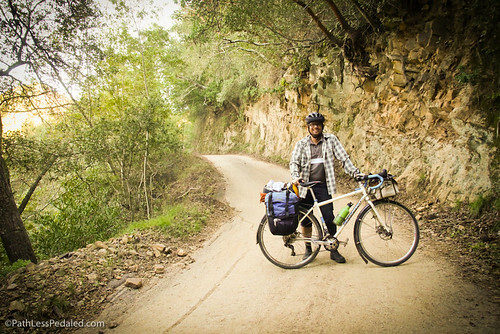 Just a few miles east of the well-known Pacific Coast route, we found the kind of riding that made us fall in love with cycling in the first place. 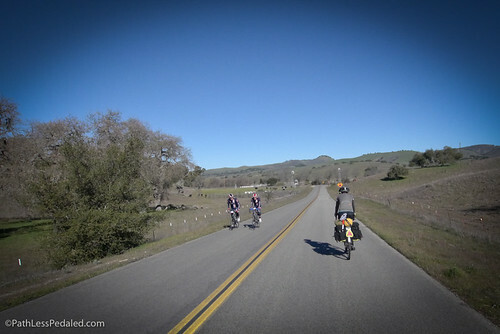 For folks in LA and the Bay Area who are looking for a great cycling vacation, Central California is easy to reach via Amtrak (San Luis Obispo is a baggage stop for folks traveling south with a boxed bike, and folks traveling north can take advantage of the new bicycle cars on the Surfliner). 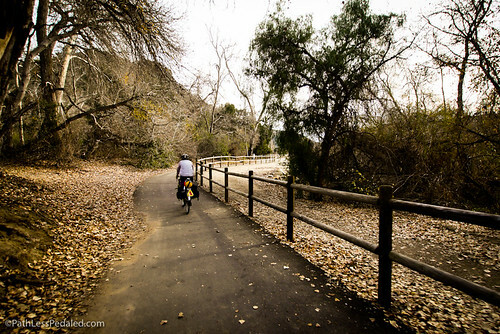 For folks who are currently buried under snow and grey clouds, winter is a perfect time to cycle around Central California, because the temps are mild and the prices are low. And the cherry on top is the fact that the burgeoning wine industry has brought good food, lots of tasting rooms, and an increase in hotels. This trip could make some great magazine articles, and not necessarily just bicycle mags. With some image creating adjustments (like when making prints from film – to create a photograph), you have many stunning and compelling pictures. Writing is calling, big writing. Eastern Oregon and now central California. You’re making me think I have good places yet to explore. One question: how are your chosen routes for people who prefer pavement to unimproved roads?